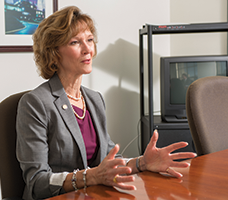 Karen Jackson hit the ground running when she became secretary of technology last year. She had an advantage that few state cabinet members enjoy. Jackson had served as deputy technology secretary since 2009 in the administrations of Democratic Gov. Tim Kaine and Republican Gov. Bob McDonnell. That background gives her sense of continuity, she says. With Virginia’s one-term governorship, “the stops and starts happen every four years. And so it’s often times difficult to pick up where the previous person left off. Jackson has earned the respect of industry leaders in tackling technology issues during the past five years. 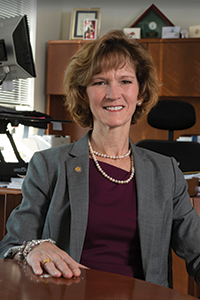 “Karen Jackson has built strong relationships with technology leaders throughout the commonwealth during her career in state government,” says Bobbie Kilberg, president and CEO of the Northern Virginia Technology Council. While serving as deputy secretary she played a key role in the creation of the Mid-Atlantic Aviation Partnership, which involves Virginia, New Jersey and Maryland. The partnership, led by Virginia Tech, operates one of six test sites in the Federal Aviation Administration’s effort to integrate the use of unmanned aircraft systems, or drones, into the national airspace. As secretary of technology, Jackson oversees the Herndon-based Center for Innovative Technology (CIT) and the Virginia Information Technologies Agency (VITA). CIT invests in promising startups and operates a business accelerator program assisting in the development of new cybersecurity firms. VITA oversees Virginia’s contract with Northrop Grumman Corp., which handles IT infrastructure, including networks, servers and computers, for state agencies. The contract is due to expire in 2019. Jackson also has been active in the federal policy initiatives including the development of the National Broadband Plan. She received a 2009 IP3 award from Public Knowledge for her work in information policy and was named to Government Technology’s 2010 list of the top 25 Doers, Dreamers, and Drivers. Jackson serves on a number of boards including the Virginia Telehealth Network, the Information Technology Advisory Council, the Policy Committee of the National Modeling and Simulation Coalition and the National Center for Collaboration in Medical Modeling and Simulation. Born in 1965, Jackson is from Poquoson where her parents still live. Her father was a blacksmith and owned a hardware store, and her mother worked for NASA Langley Research Center in Hampton. “I was used to being around technology” during her childhood, she says. Jackson holds a bachelor’s degree in business management from Christopher Newport University and a master’s of business administration from The College of William and Mary. Virginia Business interviewed Jackson on Dec. 19 at her office in Richmond off Capitol Square. The following is an edited transcript of the interview. Virginia Business: As secretary of technology, what’s your role in Gov. Terry McAuliffe’s economic strategy? Jackson: I see my role as answering the question: What’s next? We have a lot of great technology assets in the commonwealth. We have a lot of great universities and veterans that have high technology skills. We know what’s here already. So it’s my job to set the path for where Virginia is headed in the next generation of high-tech industries. VB: Does [your experience as deputy secretary in Democratic and Republican administrations] help you in being able to work on a bipartisan basis with the legislature? Jackson: It does. And the fact that technology is not a party-dependent topic most of the time has been a real benefit for us. I’ve worked on rural broadband, which brings one set of legislators. Then you work on things like cybersecurity that’s more Northern Virginia and Hampton Roads focused. So it really is less party-dependent and more topic-dependent as to who you get to work with. I’ve been very fortunate to get to work with a lot of different legislators through the years and still have some great relationships that I’ve had the entire time I’ve been here. VB: You’re the co-chair of the Virginia Cyber Security Commission. Would you say that the cyberattack on Sony Pictures is a real wake-up call for the nation about the seriousness of cyberattacks? Jackson: I think we’ve had several wake-up calls. If you look at Neiman Marcus, if you look at Target, if you look at any of the hacks that have taken place, each one in its own right has been an awakening. I think the fact that it’s the movie picture industry and involved one particular country [North Korea] … caused [the Sony incident] to be a little bit more visible than some of the other hacks we’ve had. But it’s definitely a wake-up call. We can’t ignore cyber anymore. VB: What would you say is the most critical technology challenge the commonwealth faces right now? Jackson: I can honestly say that’s sequestration. A lot of our technology companies are obviously in Northern Virginia and Hampton Roads. But it’s less location-dependent because you can have a [Department of Defense] or a government supplier located anywhere. The fact that those cutbacks are coming and are already here is going to have an impact on all of our industries. To a great degree, a lot of those contractors are in the technology sector. I think that’s going to change the landscape of the technology sector in Virginia. VB: I understand [the Northrop Grumman contract] would be coming up for renewal in 2019. What is the status of that? Jackson: Last year’s General Assembly session set aside some money for VITA to have an outside consultant come in and help with the planning for the recompete. There are a lot of structural changes that we may want to make, but we need help in evaluating what the art of the possible might be and what that means financially, what it means from hardware/software standpoints. VB: Has VITA’s performance been pretty good in recent years? Jackson: I think so. During the first year of the McDonnell administration, we changed the overall structure of VITA, actually made the [chief information officer] an appointee of the governor, which it had not been before. We changed the board composition and took away what was then a governance board and made it an advisory board, did some better alignment of requirements for the agencies in the way they reported up through the chief of staff … It provided a chain of command that went straight to the governor, and that made a big difference. Once that was in place, the relationship with Northrop Grumman has been sound, and we’ve had a very successful few years. Every larger contract is going to have challenges and bumps along the way, but overall, compared to where we started, this has been what we would consider to be solid footing. VB: What needs to be done to bring more broadband service to parts of Virginia such as rural Virginia? Jackson: That’s a tough question … The challenge about what’s left to be covered from a broadband perspective is generally a function of lower population densities and challenging terrain. That’s an expensive equation … And so for us, we’re looking at some creative opportunities … We are probably not going to be in a position to ever be able to afford building fiber to everyone’s doorstep ... So we need to look at technologies such as mobile, fixed wireless. We’re now looking at how we may be able to partner with public safety and other groups to be able to share some infrastructure [such as colocation on towers] that would allow us to take this to the next level. VB: I was at a meeting the other day where the governor was advocating putting broadband [cable in the trench for the proposed Atlantic Coast Pipeline]. Is that a possibility? Jackson: We’re looking into that right now. We are evaluating the technology piece to see what would be required to place conduit in the trenches as they’re opened. What would we need to do in order to be able to accommodate the conduit from a legal standpoint? Are there strategic partnerships with telecommunications carriers that may want to take on that portion of the project? We are involved in in-depth conversations about that right now. It’s a possibility, absolutely. But we still need to get through the technology hurdles, evaluate the technology hurdles and then see how we come out. It’s definitely doable. VB: Now another initiative you’re involved in is the Mid-Atlantic Aviation Partnership [MAAP]. What sort of opportunities do you see for that industry in Virginia? Jackson: I have to say that’s probably one of my most fun projects. It was also some of the hardest work getting to the point of having that FAA designation. Virginia has the eighth-highest concentration of unmanned systems-related industries in the nation. We have a huge amount of companies that are in the composite space, in the aviation space with NASA and the military, along with data encryption. So we are a perfect location for that test site. We have a lot of areas in varying parts of the state where it’s easy to fly and easy to test. So we’re very, very fortunate to be able to get the designation in the first place. Where we go from here, if you think about what makes up [unmanned systems], it’s not just in the air. The MAAP is just for aviation-oriented integration of unmanned systems in the national airspace. There are unmanned vehicles that are cars. There also are on-water and underwater unmanned systems. As we start to explore where we go next, there are control systems, there are sensors, there are composites, there’s cyber that have to be part of a whole system in order for the [unmanned systems] to work. So we are now looking at: How do we build a strategic plan around unmanned systems for the commonwealth that would put us in a definite leadership position and leverage the assets that we currently have in hand? We see the opportunities as pretty boundless … If you get into the component parts of [unmanned systems] and the industries that are needed to support that, it’s a very, very broad industry base, and we can build technologies throughout the commonwealth that will support the industry that don’t necessarily involve flying or, if you will, driving an unmanned vehicle. It can be a supplier to that industry. VB: Where do you see telehealth going? That not only impacts the quality of care, but the ability of the person to really control how well they do in their recovery because somebody is there keeping an eye out for them. And I think the more and more we go in that direction, the more it’s going to be beneficial. Hospital re-admittances can go down. People are able to age at home. And it’s a win/win for everybody. U.Va. has been a great partner along with VCU. They both have very robust telehealth programs. And they’re pushing that in-home monitoring. They’re pushing the envelope. We’re waiting for a lot of mechanisms, including in some cases broadband, to catch up so that they can be used more widely. VB: What opportunities do you see for modeling and simulation? Jackson: A lot, actually. Modeling and simulation can be very difficult to explain as an industry unto itself. But when you start using it as an enabler and as a tool in other industries, then you start to see how its impacts can fit. Take cybersecurity. Would it not be better to model a network and simulate hacks and learn how to defend against them rather than do it in real time? Quite frankly, that seems like a good idea. You think about the work that’s being done in climate change and sea level rise, all of that is based on high-level models and simulations. William & Mary has a great program where they are actually tracking aid data that goes out from the World Bank and other organizations down to the projects that they’re funding in foreign countries and how those funds are being used. They’re working with governments across the globe to assess how the money is flowing and how it’s used. So those are models. You can tweak the model and see how, if you changed the flow of the funding, how would that impact the outcomes? Same thing with us. If we have the ability to model transportation, simulate evacuation routes, all of those things are very powerful tools. VB: Talk a little bit about what you do outside of this office. Do you ever get time away? Jackson: Actually I purchased a home in Church Hill back in June. And it’s a historic home. It was already predominantly renovated, but I’m still having fun making tweaks and working on that. I have a 7-month-old white German shepherd puppy. He’s wonderful, but he keeps me busy. My parents are still in Poquoson, and so I spend a lot of time down there with them. They’re both in their 80s and doing very well, fortunately. I love to read, love to cook. I love what I do, and so having this opportunity and being able to just be a part of the administration has been a huge honor.